Breville has done it again. 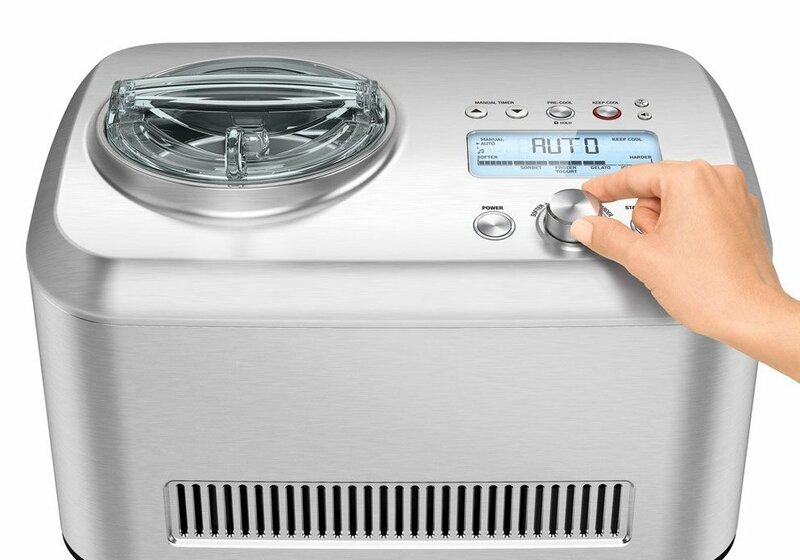 We’re blown away by the Smart Scoop Ice Cream and Gelato Maker. What sets the Breville apart from the rest is one killer feature that the other ice cream/gelato maker combo machines miss. Breville makes superb equipment and their devices are always stunning. However, what sets the Breville BCI600XL Smart Scoop apart from the competition is its unique versatility. Other machines that make Ice Cream and Gelato don’t do a fantastic job of making either. They’re caught in the middle. Gelato is quite different (and oh so delicious) compared to ice cream. The digital selector on the Breville makes is so you can select from 12 hardness settings, and it’s as easy as turing the dial. The Breville automatically calculates the differences needed in its processing rhythms to make the best gelato possible. This feature alone places the Smart Scoop above the competition. It’s just so easy to select the setting you want, but because of the handy display, it’s easy to see on the indicator the precise setting you want for the dessert you’re making. It’s that easy taking the guess work out of making gelato. You find the setting that’s set to your liking, and boom, you’re done. Breville really put time into the design of their Gelato Maker. The look speaks for itself. The Smart Scoop really stands out. The Breville tops the class with it’s solid dial, buttons, it’s beautiful finish and gorgeous display. The Breville is a gelato maker that not only makes great gelato, but that is stunning and draws attention for a design that shows an attention to fine detail. One thing that you’ll notice with the Breville are the sounds to let you know when the Smart Scoop is finished. If you have kids, they’ll go crazy over the jingles, but if you prefer the chime, it’s easy to make the switch. With its own compressor, you don’t have to place the ice-cream in your freezer! One thing to note is that because it has its own compressor, you need to let it sit before first use (about 12 hours) to let the refrigerant settle. The control panel/display places Breville heads and shoulders above the competition. With it’s sleek design (like other Breville Products), the Smart Scoop is a smart addition to any kitchen. The Breville Smart Scoop has over 90 reviews on Amazon with an impressive average of 4.5 out of 5 stars–a near perfect rating.